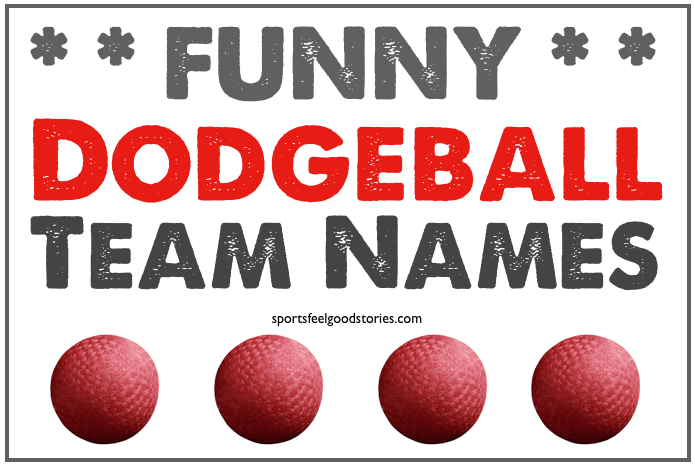 Looking for some funny dodgeball team names? By its nature, the game was designed to enjoy and have some fun with. Likewise, your team name should reflect a spirit of fun. Take a look at our lists of names below to find one to your liking. 2. Elusive Butterflies of Love. 3. Chuck, Duck and Dive. 6. In the Dodge house. 10. Who let the Dodgers out? 11. Aim for the fat kid. 12. You really miss me. 18. Great Balls on Fire. 24. You Can’t Dodge This. 27. Won’t Move for Cake. 34. Ball of Duty 3. 35. Who Let the Dodge Out? 40. Not in the Face. 63. We’re Aiming For The Fat One. 74. Las Vegas Police Department. 75. Much Ado About Balls. 76. Not in The Face. 79. Blood Sweat and Beer. 83. Dodge, Dip, Duck and Dive. 85. Dodging Under the Influence. 90. Get out of Dodge. 113. Dodge City Dodgeball Dodgers. 117. Captain Crunch and the Cereal Killers. Any suggestions for funny dodgeball team names? Let us know via the Contact page. Thanks. “Dodgeball is a game in which players on two teams try to throw balls at each other while avoiding being hit themselves. In North America, the game is typically played among children 6–12 in elementary school. However, internationally, the sport has also emerged as a popular middle school, high school and college sport and in some countries universities also play the sport. It is also popular in informal settings and is often played on a playground, community or in organised recreational leagues.